I want to know why my actions created in controller don't appear in selection of the arms. Thanks, we are already researching your issue. It will take some additional time. I can’t to reproduce your issue. 2. You have to read ticket Missing Link in Xafari Documentation and documentation GettingStarted for ARM. 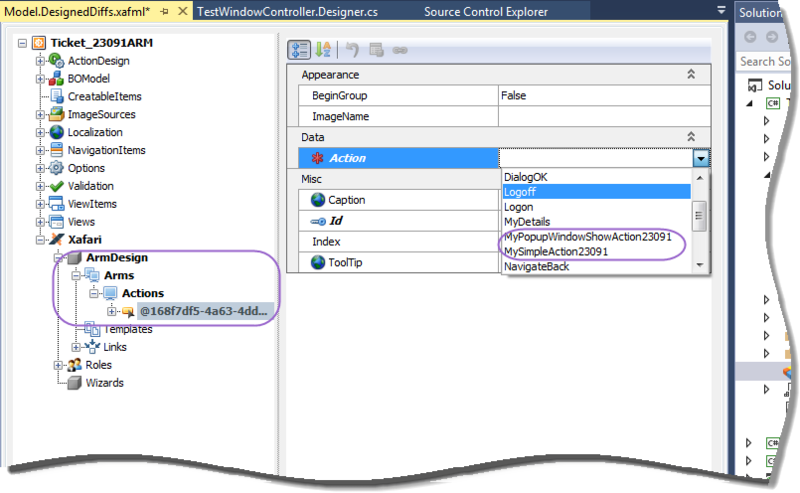 add interface IModelYourAppName and controller EnableARMsViewController. add and realise CreateCustomTemplate event. implement the ISupportArms interface in the Default class. 3. Add controller with actions. Thanks for your help! I already got it. I discovered that the actions were not showing up in the selection had been created in a ViewController. Then, I created the actions in a WindowController and solve it.